I ordered a “new” trunk lid yesterday because I’ve been dying to swap in the pre-facelift trunk, which I think is a massive improvement over the hideous redesign (pictured, not my car though). Aside from being ugly, my trunk also has a gnarly rust bubble and a nice corrosion line from the spoiler, as well as four poorly filled holes (by yours truly) where the spoiler was attached. This is the original design. Much cleaner and more complete as far as I’m concerned. 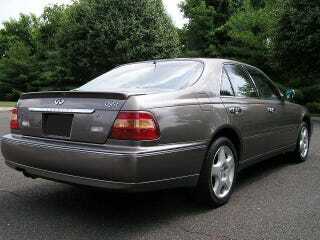 I prefer the “Infiniti” text over the giant bar, and the extended headlights too. By comparison, the facelift tails look incomplete. Just an ugly reverse light floating in empty space. The trunk lid was not only reasonably priced but I’m also 99% sure it’s even the same color as my car already, so I don’t need to have it painted. SCORE.